First woman: the more widespread and familiar word ژن zhin “woman”. Russian жена (žená), Polish żona, Czech žena, Avestan gənā, Ancient Greek γυνή (gynē), English cwēn/queen, Norwegian kvinne , Sanskrit gnā;jani, Old Prussian genno, Old Armenian կին (kin), Albanian zonjë, Irish ben/bean, Welsh benyw, Kashmiri zanānū', Old Church Slavonic жєна (žena), Gothic qinō, Old Norse kona, German quena/--, Persian /zan, Phrygian knaik, Tocharian śäṁ/śana, Luwian wanatti-, Pashto šëdza/khëdza, Kurdish jin. Note the term gynecology is from the same root: from the Greek γυνή gyne. "woman" and -logia, "study." The word دوت“dot” related to English daughter Persian duxtar is preserved in Kurdish only in words like dotmaam cousin or daughter of the uncle from paternal side from dot and Arabic عم uncle. 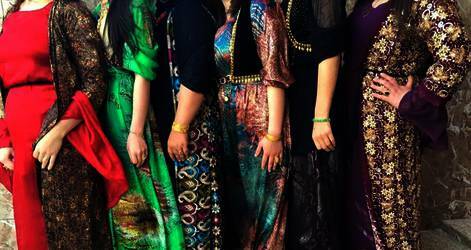 Fourth daughter: Many words exist for girl /daughter in Kurdish: کچ – کنیشک – قز- چیژ- دوت kech /kich qiz , dot, kenishk. Probably kich is related to zaza kena, It remains to be seen whether kich it is realated to English kin. Fifth bride: Kurdish buk after changing w /v to b in Kurdish (compare also Kurdish bist twenty from Avestian vist) from Pahlevi vuyók, Zazaki veyve.